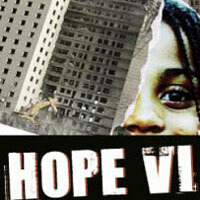 Hope VI tells the story of Hope Graves, age six, a high spirited and funny young girl who has become strangely quiet since her mother beat her in the head with a steel-toed boot. A scar covers the length of her face, but she escapes the pain of her dreary life into the world of TV. Hope VI is the journey of her dream and her family�s struggle to survive after the wrecking ball hits the Robert Taylor homes on Chicago�s Southside. "...There are opportunities here to explore the troubling issue of how poverty turns citizens into refugees, but Kelley's script moves in too many directions--most of them telegraphed in advance--to keep the focus on any one thing for long. Najwa Brown's assured and irresistible performance as Hope marks her as a very young talent with a bright future." "...Unfortunately, playwright Nambi E. Kelley and director Ilesa Duncan have failed to capitalize on the fascinating ideas at the center of the play. The production currently onstage at Chicago Dramatists plays as half-made in every way. Kelley's script feels half-written and unshaped. The domestic tragedy is uninvolving, as the characters don't quite add up to convincing wholes, the social background is never convincingly connected to the family's story, and the fantasy sequences, though showing flashes of excitement, are never quite creative enough to bring the production to life." "...Kelley regrettably matches these delicate renderings with a thick dose of heavy-handedness. Next to carefully wrought Messiah, Queenie�s a poorly matched ball of unrelenting rage. A skillful portrayal by DuShon Monique Brown (no relation to Najwa Brown) can�t compensate for two out-of-left-field plot twists launched by Queenie�s violent outbursts, which leave Hope feeling as emotionally exploitative as a Lifetime yarn." "...The fantasy scene is a campy blast, with the fabulous Sandra Watson hilariously channeling the "Whoopster" and adorable little Najwa Joy Brown bursting to life as Hope. It makes the tragic conclusion even more painful as Queenie's rage explodes and threatens the ones she loves the most. DuShon Monique Brown is powerful as the destructive and self-annihilating mother, while La Donna Tittle positively glows with maternal wisdom as Messiah. "Hope VI" is a genuine Chicago story by an accomplished playwright who speaks the truth, as unflattering as that sometimes may be."